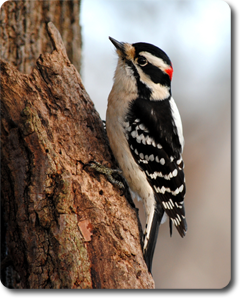 "Downy Soft" The Downy Woodpecker is the smallest woodpecker in North America but they are known to all people because of how well they adapt to living near human activity. A stalwart at any bird feeding station they quickly jump into the hearts of all people who take the time to get to know this small yet magnificent woodpecker. The little fella was captured on Bluebird Ridge in eastern Daviess County, Kentucky. The Metal Print is an 8"x10" color photograph dye sublimated onto a high quality piece of glossy coated aluminum to give the image a glossy and long lasting finish! * Dye Sublimation is used for the printing process for the products shown. Each item is unique as there may be slight variations in the printed image. No products will be exactly alike when printed, but all products are checked for quality before being shipped to you! Depending on the stock of the metal used in production from the supplier, the 'Metal Prints' may have rounded or squared corners.